This is a view of the distillery from the west, not sure if these rocks have a name. 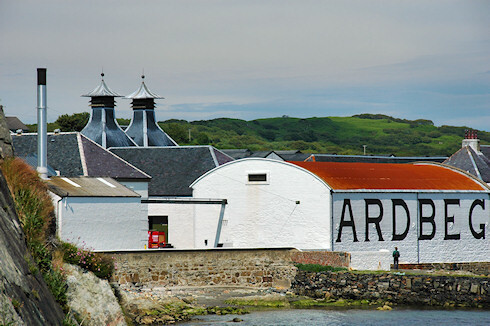 You get some nice views of the distillery from here, if you have QuickTime installed on your computer you can try the Ardbeg Distillery and Coastline Panorama, Islay for the whole area. Of course I will post the larger version (larger as in more than twice as big) on the Islay Pictures photoblog on Saturday morning as usual. Oh, and the person you can see standing on the pier is my sister. Unpronouncable volcano and BA cabin crew permitting she might well stand there again in two weeks or so. Have a great (bank holiday) weekend!